How do chefs seek inspiration on culinary tours abroad? Pig & Khao's Leah Cohen explains the challenges of re-creating a Southeast Asian favorite. Every year I plan an R&D trip to Southeast Asia to seek culinary inspiration from that part of the world. This year I decided to revisit Vietnam. It had been about five years since my last trip there and I was dying to get back. There is something to be said about how a chef travels compared to a typical tourist. Many people go to a country and want to visit the palace or pagoda; they want to see the big attractions, which I do as well. But that always comes second to the food. In order for these excursions to be worth my while, I need to aggressively eat my way through its local markets and vendors. 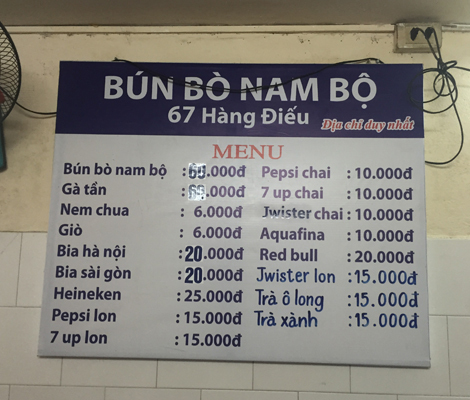 There is a bounty of amazing food all over Vietnam, but one of my favorite dishes is called bun bo nam bo. 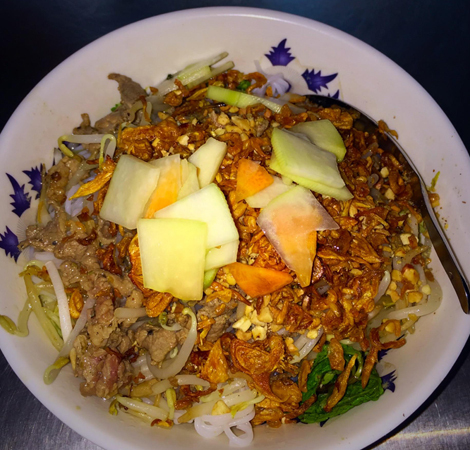 It consists of stir-fried lemongrass beef over fresh rice noodles, garnished with crispy shallots, peanuts, herbs, lettuce, and pickled papaya and carrots. The dish is balanced with just the right amount of broth. I had been craving this dish since the last time I ate it at an unnamed stall in Hanoi (which you can only find with the address and a photo of the exterior). Nevertheless, I immediately made my way back there when I first landed. In the front of the stall there are two women working. One serves as the chef, preparing the noodle dish, while the other woman collects your money. Just as I was about to take my first bite, I paused: I became nervous that the meal would not live up to my memory, that maybe I built it up so much in my head and would be completely disappointed. But those fears quickly vanished once I took the plunge. The hype was real—this dish was truly special. That was the moment I knew I needed to learn everything I possibly could to recreate these flavors. Some of the dishes I try abroad I know I will never be able to recreate at home, but the chef instinct usually kicks in and I feel compelled to challenge myself. The roadblocks can vary: sometimes the food won’t align with people’s tastes; or there are more practical matters of ingredients and methods that would never jibe with an NYC kitchen. But sometimes you really do get lucky, which is why my rule of thumb is this: I never dismiss anything I learned abroad until I try to make it at home. The bun bo nam bo, it seemed, was just the dish to try to replicate. I started by studying every move of the the woman preparing the dish. There is a tiny little wok where she stir-fry’s the marinated beef. She adds some sort of stock and then ladles that mixture over the fresh rice noodles. It is then garnished with lettuce, herbs, peanuts, crispy shallots, and pickled papaya and carrots. Seems simple enough right? To a certain extent nothing is extremely complicated. The hard part, as always, is achieving that perfect balance. 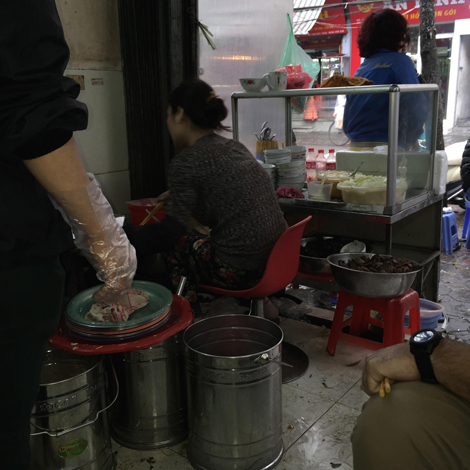 After I had a general understanding of what to look for in the dish, the next challenge was to find someone in Hanoi to teach me how to make it. Luckily I was able to track down a cooking class that would allow me to hone my skills. I was introduced to my translator, who promptly took me to the market to gather the ingredients. The first thing we purchased were rice noodles. The translator told me that no one makes their own, so instead they buy them fresh from the market daily. Right then and there I knew I was fucked, and that the biggest obstacle to replicating this dish back in NYC would be finding the right noodles. After picking up the rest of the ingredients, we headed back to the school to meet the chef. He spoke zero english, and although I had a trusty translator, she didn’t know much about cooking, let alone this dish. Needless to say, a lot got lost in translation. To make matters worse, this chef’s version of this dish was completely different than what I had eaten the other day! There was absolutely no depth of flavor. I was royally pissed and thoroughly unimpressed with the other dishes he showed us that day. But not all was lost: I did learn the ingredients in the beef marinade—even if his proportions were off, I knew that the extremely flavorful beef stock was the key to unlocking the bun bo nam bo code. When I got back to New York, I was beyond excited to get into the kitchen and start working on it. After looking through many online recipes, I learned the broth is a less intense pho bo stock, which I already had a good recipe for. Next step was finding the right rice noodles. 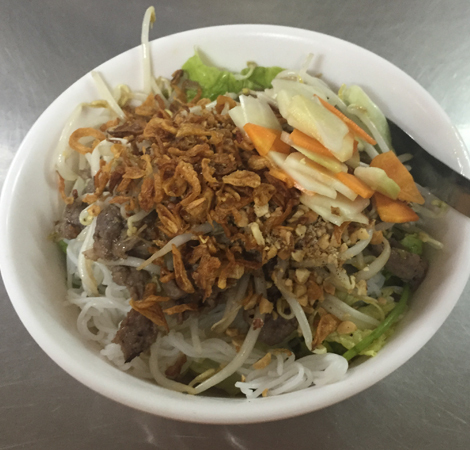 I reached out to all my vendors and asked them if they could source a fresh rice vermicelli. The answer was a resounding “no,” so I sampled at least eight different dried rice vermicelli noodles until I found one that was not an exact match, but one that I could live with. Those are the sacrifices you have to make sometimes. Right then and there I knew I was fucked. I also wanted the dish to be cost effective for the restaurant, so I decided to use leftover sirloin trimmings from a different dish. The pickling liquid for the carrot and papaya was something I adapted from a pre-exiting recipe, modifying it slightly by adding more salt, sugar, and vinegar so that the pickles would deliver more of a punch. And finally, the last step to round it out was picking the right herbs, and Vietnamese mint, shiso, and cilantro were all easy to procure. I had my staff taste it first, tweaked it, and then offered it as a special, encouraging the waitstaff to get feedback. The ultimate test was having my mom try it—she’s my hardest and most honest critic. She approved the dish, making me confident it was finally ready to be added to the menu after weeks of research and testing. Every time I introduce something new on the menu, I worry that someone might feel I am mis-representing it. One of the biggest fears I had before opening Pig & Khao was that people would think I was bastardizing their cuisine. From an outsider perspective, I am just a white girl cooking Asian food—a remark that has been levied at me countless times. I am constantly being asked by people who don’t know my background (I’m half Filipino), “What is a nice Jewish girl from Westchester doing cooking Southeast Asian food?” Even if I can’t escape that narrative, I can, at the very least, honor the story of a dish like bun bo nam bo.